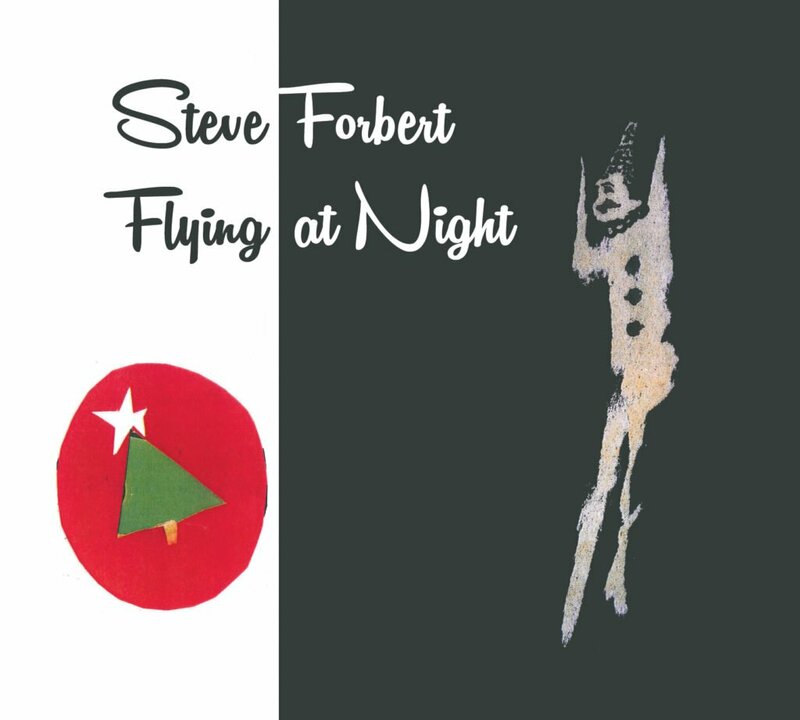 There is something pleasing about the opening lyrics of Flying At Night, the latest release from American folk singer Steve Forbert: ‘I love the night’. With that first line, simple and inviting, the first word sonorous and drawn out, the listener is eased into the rhythm of the album like a needle is lowered onto the surface of a vinyl. This opening, eponymous track is one of the album’s shortest but strongest. A thick bass line and steady, rolling percussion bring an echo of bluegrass to the backing, and its closing lyrics—Sky’s an open byway/ Stars are made for dreams—capture a note of optimism reproduced throughout the record. Picked acoustic guitar has always formed the backbone of Forbert’s songwriting, and accordingly you will find the album’s hooks playing back in your head as if they had been sung by a solo acoustic player. But it in fact contains some of his most varied and interesting instrumentation, perhaps because it was produced by multi-instrumentalist Anthony Crawford, who Forbert says “ran free with the tunes, adding whatever he wanted from his home studio toy box”. A clarinet and accordion (I think) provide the lead throughout ‘Belle of Baltimore’, a lightly delayed slide guitar lends a Hawaiian feel to ‘An Hour Or So’, and choral harmonies give a diverse, ethereal quality to the vocals on ‘Out In The World’. Nine of the album’s eleven tracks were unfinished songs from the last several decades. To attempt to guess which were begun when would be to set oneself up to fail, but ‘The Dream Song’ and ‘Dear Angel’ would sit comfortably on More Young Guitar Days, a wonderful 2002 release made up of live and studio work from between 1975 and 1982, as would ‘Quiet Day’. ‘Never Trust A Man Who Doesn’t Drink’ draws on Forbert’s experience of life after rehab in a culture where bar signs dominate, ‘Especially after dark’, its chorus supplementing its title with the words ‘Unless he simply can’t’. For me the standout track is ‘Listen To The Mockingbird’. A shimmering, lightly-picked guitar melody reinvokes that earlier note of optimism, reinforced by more simple, inviting lyrics—‘Woke up one bright morning/ Woke up in the rain’—and the hopes of the listener are heightened before the fall: ‘Woke up to the sunshine/ And the pain’. What follows is a reflection on hopelessness and revival in the vein of Forbert’s earlier ‘Thinkin’’ and ‘You Cannot Win ‘Em All’. The track is also beautifully mixed. The glints and nuances of Forbert’s picking are all audible as his delicate caws flit above, with the effect that it almost sounds like a live recording. I once read an account from someone who had been present at a venue while Forbert was sound checking. They wrote that he spent some time asking the sound engineer to take the volume of his guitar and vocals lower, and a bit lower, and a bit lower, until it was low enough that if the audience wanted to hear they would have to listen. I don’t know whether this story is true, but if it is the technique is used to make the most of songs like this. To allow Forbert to draw his audience in, to tell them about their own lives, and to surprise them. Among my favourite of Forbert’s songs have always been his livelier, uptempo tracks of the sort that have been markedly sparser on his more recent records. Flying At Night still doesn’t have its equivalents of ‘It Sure Was Better Back Then’ or ‘Rock While I Can Rock’ or ‘As We Live And Breathe’, but songs old and new have been given life of their own with a sound that’s relaxed and bright and pensive, and it suits him well. Flying At Night is released today. It is a UK-only release to precede Steve Forbert’s UK tour, which kicks off in Derby on October 20th. You can read TSOTA’s 2015 interview with the man himself here. There is something pleasing about the opening lyrics of Flying At Night, the latest release from American folk singer Steve Forbert: ‘I love the night’. Forbert draws his audience in, tells them about their own lives, and surprises them.